The American Red Cross has apologized for a pool safety poster criticized as racist. 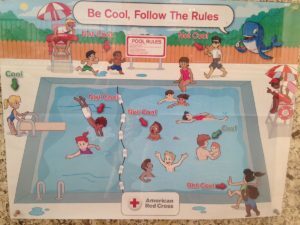 Some said the cartoon poster depicting proper and improper pool behavior singled out black children as the unruly ones. It appeared to portray what appear to be white children as “cool” and children of color were “not cool. Chipotle Mexican Grill will launch a new summertime loyalty rewards program, as the Mexican restaurant tries to lure back customers to its outlets after a series of food-related disease outbreak. In response, rival Moe’s raised its prices by $1 and dared everyone to go to Chipotle. I dated a girl named Listeria Monocytogenes in high school. Greek family, very strict dad.